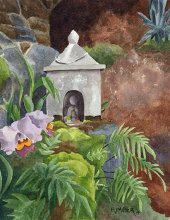 Artwork Dimensions (unframed): 11" x 14"
The Koloa Jodo Mission on Kauai's south shore was established in 1910, the first Jodo Shu mission on Kauai. Jodo Shu (Pure Land Buddhism) was introduced to Hawaii 16 years earlier in 1894. 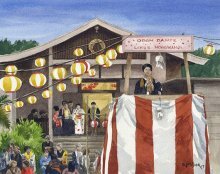 Japanese immigration to Hawaii that began in 1868 marked the beginnings of large-scale settlement and, with it, the establishment of a strong religious base of Buddhism. The temple is a fine example of early period Japanese temples built in the Islands, and is one of only a handful still standing. A Japanese dry land garden and four stone lanterns were installed surrounding the temple to commemorate its 100th anniversary in 2010. The temple is currently used as a columbarium, with services held at the adjacent new temple built in 1985. This painting was completed in the studio from photographs, maintaining the looser style of my plein air paintings.